Regular School Hours: 9:20 a.m. - 3:40 p.m. The primary grades (K-2) at Harley Avenue Primary School provide an enhanced language arts program, which reflects the district’s commitment to early literacy development. The use of big books, leveled readers, and original stories develop skills and elevate strategies for balanced literacy thus creating an authentic literacy experience for the students. Our literacy program in kindergarten through second grade provides experiences in critical thinking and utilizes the best of children’s literature. The Teacher’s College Units of Study in Reading, Writing and Phonics support student growth & love of reading and writing. The mathematics program is based on the constructivist theory with an emphasis on concrete experiences. Basic skills are emphasized, with stress placed on thinking and practical use of mathematics, such as measuring, estimating, and probability utilizing a variety of manipulatives. Science instruction and activities take place in class and in the science lab. Students are actively involved with hands-on science experiments. The district’s technology initiative has provided about 12 chrome books and a Smart Board in each classroom. The district commitment strives to integrate technology as an instructional tool. We are excited to launch a Maker Space at Harley Avenue this school year. Our school day is from 9:20am-3:40pm and each day includes a special subject area: library, art, music, or physical education. English Language Learners in kindergarten, grades one and two will receive instruction according to their English proficiency. Instructional support in academics as well as related services are provided by trained personnel in reading, math, speech, social work and psychology. Academic intervention by the teachers and specialists is provided in reading and math. Two trained reading teachers instruct students in a literacy lab setting in small groups for thirty minutes in multiple cycles throughout the year. We also have an intervention period (OSCAR) within our school day. One math intervention teacher and math TA will support students in small groups throughout the school year. The goal of academic intervention is to assess need and to provide remediation so the student can perform successfully within the classroom. Each child has the opportunity to learn. Not only are support services available, but also each professional is responsible for creating, a caring school community. Keep an eye out for our Harley Knight of the Month pep rally dates. 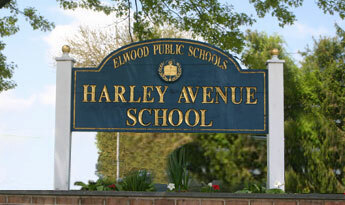 At Harley Avenue we promote excellent character and celebrate students who exhibit those traits. On these days we ask that all students wear their Elwood or Harley T-shirts (or Blue) to show school spirit. The Harley Avenue faculty members are highly trained, certified educators, coming from diverse backgrounds to work together to provide an outstanding early childhood program to our district’s youngest population.